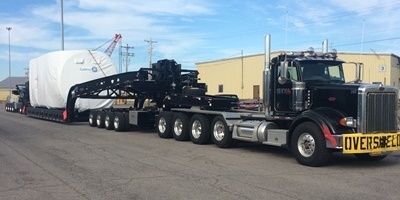 Aspen’s S-Series (Super Haul Series) steerable transporters are designed for crane loaded payloads which primarily serve the super haul industry and are for on road applications. Configurations vary from payloads of 40 tons through 110-ton capacities, with axle configurations ranging from 7 through 17 axles (including truck axles). Aspen S-Series trailers feature double drop, non-wagon style (tractor supports payload via jeep) decks. The S-Series trailers have common air/regulated air suspensions, with transporter equalization achieved by mechanical equalizing dolly “steerable” trunnion suspensions. Aspen’s S-Series of trailers are available in specific regional interstate configurations (United States and Canada) to maximize trailer configurations for specific regional regulations.